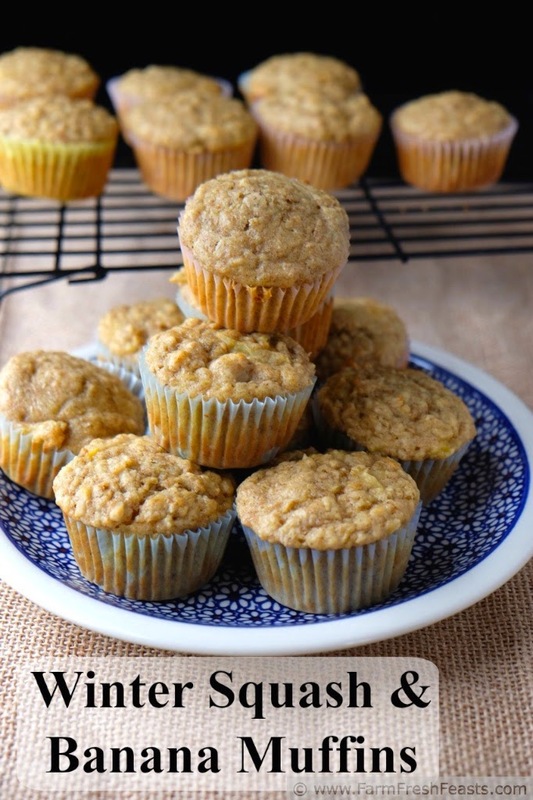 Working title Asante Sana Squash Banana Muffins*, these soaked oat, wheat and flax muffins have roasted winter squash with banana and maple syrup for sweetening. Like other banana-containing baked goods these are terrific the next day and make a great breakfast or afternoon snack. I'm not a control freak in the kitchen. I usually welcome all the help I can get [and I'm still enjoying the fruits err vegetables of my niece's and nephew's labors over the holidays when I had them chop up what turned out to be 5 recipes worth of mirepoix aka onion, celery, and carrot. Oopsie. Well, Faster Kirsten miscalculated but appreciates the effort nonetheless. Tak, Albert & Astrid.] Sometimes, though, the help is not entirely helpful. Unless your kitchen is populated by creatures who haven't figured out how to open the fridge door or who haven't mastered lifting the lids off containers, you've probably experienced a 'helpful' and hungry kitchen assistant 'cleaning up' the leftovers that were actually planned overs. Perhaps you intended the various parts of the meal NOT to end up all in the same container [because, you know, the light sucked at dinner and you wanted to photograph your leftover lunch for the blog]. The addition of flax into my standard soaked oatmeal muffin recipe came because of a helpful kitchen mate. My spouse dumped a bunch of ground flax seed into the container of rolled oats, thinking it would boost the nutrition of his morning bowl of oatmeal. He was not quite satisfied with the results, so I offered to take the rest of the container off his hands despite knowing I couldn't use any of the results for the blog [he didn't measure the amount of oats remaining in the container nor the amount of flax he dumped in with them]. After making muffins, waffles and more muffins I decided the combination is pretty useful, so once I'd emptied the container I played around with the amount of flax seed and came up with this version. I've made these muffins three times now, and even shared them with the terrific physical therapists working with my son. 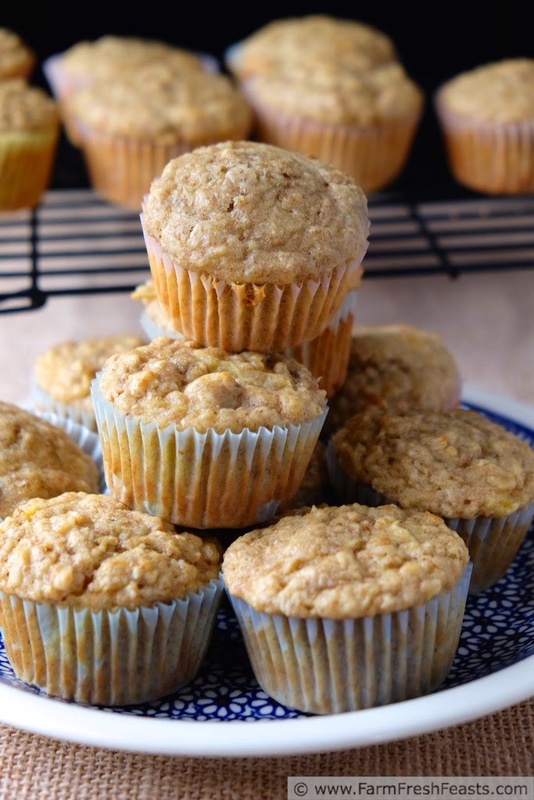 It's been a while since I've posted a Monday Muffin recipe [like, last year, man], so I figured I'd kick off 2015 with these. Since I'm using maple syrup and a banana for sweetening, if you've made any resolutions regarding granulated sugar these would still fit in with your goals. If, like me & Meghan you've still got a pile of winter squash in your basement . . . well, here's an idea of what to do with it that the family--and the physical therapists--approve. For other ideas using Winter Squash, please see my Winter Squash Recipes Collection, part of my Visual Recipe Index by Ingredient. 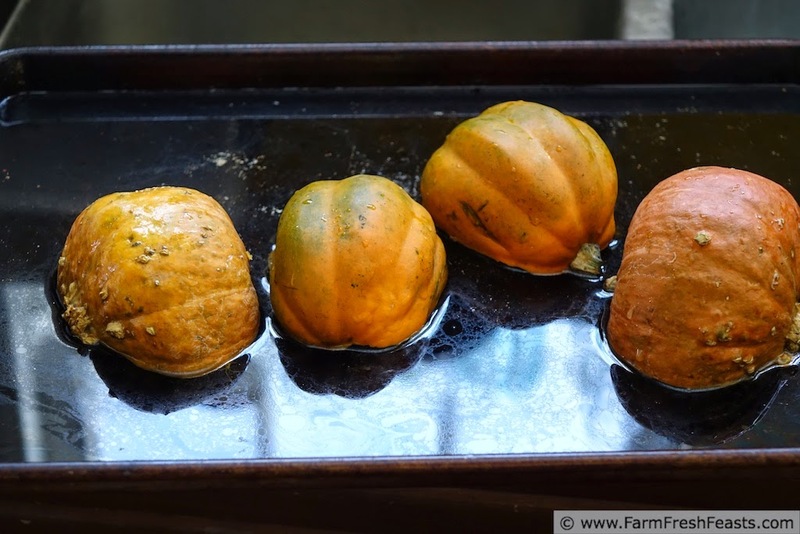 To roast a winter squash, cut it in half as shown, scoop out the guts [compost?!] and place face down on a rimmed baking sheet or casserole dish. Add water to cover the bottom of the pan, and place in oven. Turn the temp to 400 degrees Fahrenheit and roast until the sides 'give' when you squeeze them, usually around 30 to 75 minutes depending on the size. The resulting puree keeps in the freezer for months. Just make sure to label it. Note: these soaked oatmeal muffins, like my Basic Soaked Oat Muffin Recipe, are best if you start the night before by soaking the oats. 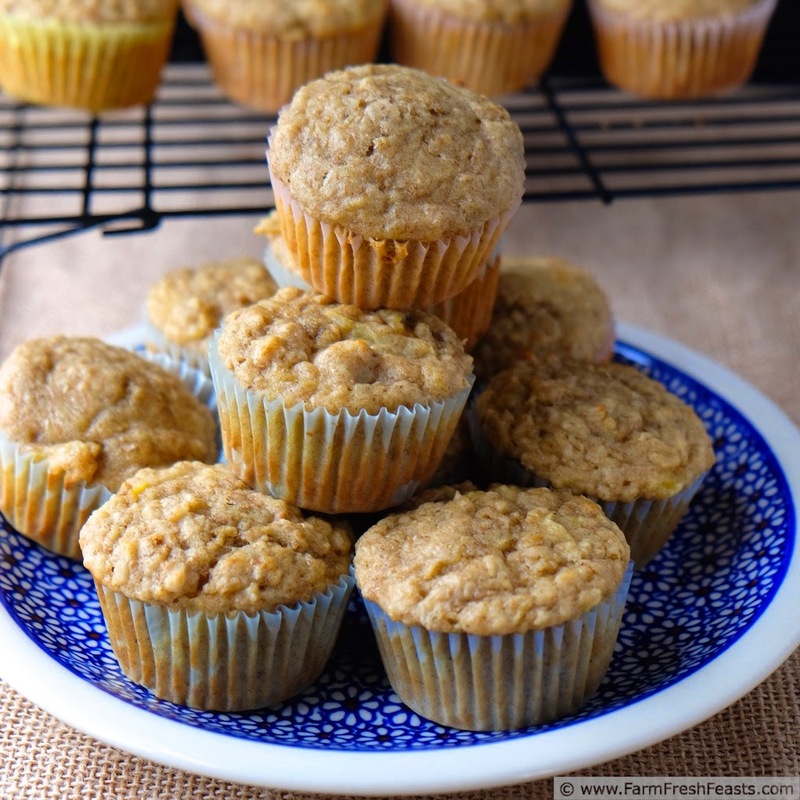 You can also prepare several batches of oats+flax+buttermilk and chill for up to 5 days so you can make muffins on a whim. The night before--combine oats, flax, and buttermilk in a large bowl. Set on the counter in a cool kitchen or chill overnight. When you're ready to bake--preheat the oven to 400 degrees Fahrenheit. Spray a 12 well standard size muffin pan with vegetable oil spray or line with paper liners. Add squash, banana, egg, maple syrup and vanilla to the bowl of oats. Mix well (I use a whisk for this part). Dump dry ingredients on top, and stir just until combined. Scoop** (Amazon affiliate link to my muffin scoop) muffin batter into prepared pan. Bake for 15 minutes, then cool in pan another 5 minutes before transferring to a cooling rack. Good warm with butter or at room temperature plain. I haven't tried freezing these. *Have you seen the movie Lion King? This is from a song Rafiki sings to himself, and I was singing along as I fixed these muffins. 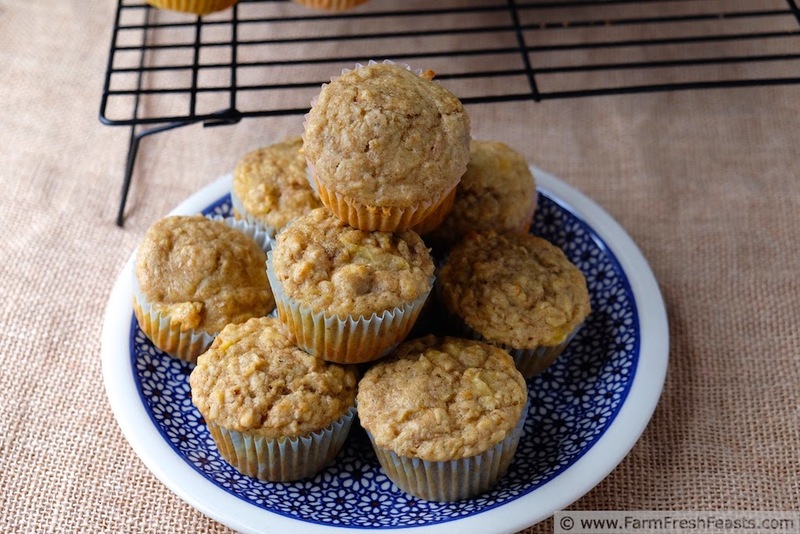 I like the idea of flax in your muffins, and even appreciate how it came about. The Hubby dumped the leftover veggie stir fry and rice into the same container last week, and I was like Nooooo, I had plans for the veggies. Oh well, such is life. I'm training the kids--before they snag a container of leftovers they'll ask if it's been photographed, and they know to pick the ugliest muffins to eat ;) .